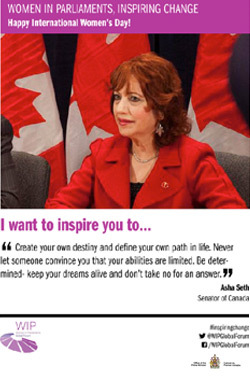 The Honourable Dr. Seth, the first Indo-Canadian female to be appointed to the Senate of Canada, is an obstetrician and gynecologist within family practice. Born in Sitapur, Uttar Pradesh, India. She earned her Bachelor of Medicine, Bachelor of Surgery (MBBS). Among other achievements at medical school, Dr. Seth was instrumental in organizing a blood donation clinic in service of the Indian Army during the Sino-Indian conflict. From very early on Dr. Seth’s parents developed in her a great respect for people in need, a prerequisite for opening one’s heart to the less fortunate. She tries to lead her life with humility and generosity, a virtue inculcated in her from the time she was an impressionable young mind in India. Upon her arrival in Canada in 1971, Dr. Seth finished her resident training in obstetrics and gynecology at St. Joseph’s Health Centre and The Hospital for Sick Children in Toronto. She has dedicated her career and personal life to improving the health and life of others. Her philanthropic work has earned her the respect and recognition of her community and has inspired many to follow her example. Philanthropy has been a mainstay in essence of Dr. Seth’s work. Living up to the mantra: “Give back more than you take”, she has been involved in many charitable endeavors. Some of the highlights include: founder of the Canadian Foundation for Health and Human Welfare; Patron of the Canadian Council for the Blind; fundraising for the Philippines typhoon recovery in 2014; National Fundraising Chair for the CNIB, National board director for CNIB;and founding president of the NIMDAC Foundation; chair of fundraising for the Heart and Stroke Foundation; a contributor to the “Aim for Seva” project, where she funded a home for 100 underprivileged children near Lucknow; a member of the Board of Governors of the Canada-India Foundation; co-chairperson for the fundraising committee for the St. Joseph’s Foundation; chair of the Police Bravery Advisory Council; on the Advisory Board of the Indo-Canada Chamber of Commerce; among others. 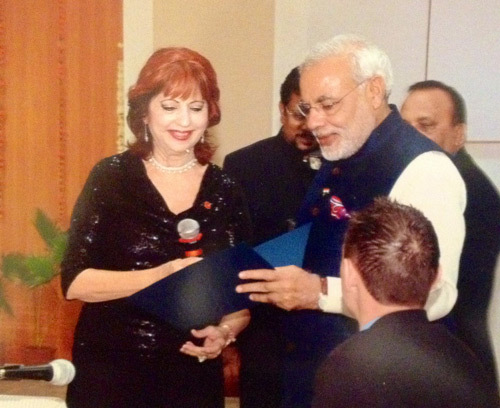 The Honourable Dr. Asha Seth has also been publicly recognized for her humanitarian work, and has been the recipient of many awards, including: a lifetime achievement award from the Dancing Damsels (2016); Times Now – ICICI Bank “NRI of the Year” Award 2015 for Philanthropy; “Peace Dreamer” Award 2014 from the Sri Chinmoy Foundation of Canada; Kayastha Group: Community Leadership Award (2014); Grant’s Desi Achiever’s Award for excellence and contributions to the South Asian Community and the Canadian mosaic (2012); Queen Elizabeth II Diamond Jubilee Medal received from the Governor General of Canada (2012); the Council Award by the College of Physicians and Surgeons of Ontario (2011); Recipient of the Canadian Immigrants People’s Choice Award as one of the top 25 Canadian immigrants (2010); India Abroad Magazine’s Power List: 30 most Influential Indo-Canadians (2010-2011); Honoured by Canada India Foundation as an achiever in the public arena (2010); Honoured and named patron of Association of AWIC community and social services (2004). The trust and admiration of her country was crystallized in her appointment to the Senate of Canada, where she became the first Indo-Canadian female to be a member. In this role, Senator Seth adopted humanitarian causes such as International Maternal, Newborn, and Child health and the welfare of disabled people. She has succeeded in bringing new attention to causes such as maternal and child mortality and her efforts are felt around the world by millions of people. In the Senate of Canada, Senator Seth also sat on many committees, including: Standing Senate Committee on Aboriginal Affairs; Standing Senate Committee on Social Affairs Science and Technology; Standing Senate Committee on National Finance; Standing Senate Committee on Internal Economy, Budgets, and Administration. During her time in the Senate, Senator Seth also did much to strengthen diplomatic ties between Canada and India. 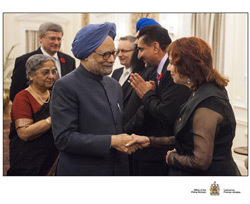 She travelled to India three times on behalf of the government of Canada, including in 2012 for Canada’s longest ever trade-mission to India; in 2013 Senator Seth again travelled with a trade-mission and met with Prime Minister Modi to whom she delivered greetings on behalf of the government of Canada, attended a forum of the ICCC, while also visiting Uttar Pradesh and Gujarat; again in 2013, Senator Seth organized and executed the first ever trade mission to take place between Canada and UP. The Honourable Dr. Seth continues to engage high-level stakeholders in India with the goal of expanding academic, cultural, and commercial exchange. She was selected as Non-Resident Indian representative for the state of Uttar Pradesh at the Pravasi Bhartiya Divas 2015 conference in Gujarat due to her contributions to a new policy of economic and cultural openness in Uttar Pradesh. May 1st, 2014 –The Honourable Dr. Asha Seth launched the first-ever National Vision Health Month with the unanimous support of her colleagues. A united Senate joined Senator Seth in her campaign to recognize May as a month to educate Canadians about their vision health and help eliminate avoidable sight loss across the country. Senator Seth created the government-endorsed the “International Maternal, Newborn, and Child Health Week” campaign, as an important platform in the effort to decrease maternal and childhood mortality. She continue working with civil society organizations. In March 2016, Senator Seth established as chairs an advisory group in Parliament entitled “Parliamentary Nutrition Champions”. This is a continuation of her unanimously supported motion for International Maternal and Newborn Healthcare Week. The Honourable Dr. Asha Seth continues to practice medicine in Toronto. The Honourable Dr. Asha Seth travelled to India from March 7-21st, 2017 to advocate for better health and nutrition globally for women and children. The visit included New Delhi and Lucknow, where Dr. Seth visited the offices and programs of Nutrition International (formerly known as Micronutrient Initiative.) Through these first-hand experiences with nutrition programming at the grassroots level, Dr. Seth’s commitment to advocating for nutrition has grown – particularly for women and girls. Dr. Asha Seth lives in Toronto with her loving husband, Dr. Arun Seth and she has two accomplished daughters: Angie Seth & Dr. Anila Seth. The Honourable Asha Seth’s unabated passion for mother and child health is her mission- her journey continues!